Atlanta, GA and Savannah, GA are about 250 miles apart. Atlanta, perched in the northwestern portion of the state, is the state capital and largest city in Georgia with a population of approximately 450,000. On the opposite end of the state, in east central Georgia not too far from the coast, is Savannah with a population of about 142,000, the oldest city in the state. How far is Savannah from Atlanta? The distance from Atlanta to Savannah is about 250 miles. Atlanta, GA is home to a large airport: Hartsfield–Jackson Atlanta International Airport. The airport has much to offer including shopping, dining, and many services such as assisting folks with disabilities and helping with traveling pets. It is a major hub for Delta Airlines. A round trip flight from Atlanta to Savannah is likely to be the fastest way to travel. Delta offers non-stop flights with weekday fares coming in at just over $200 and about 1 hour flying time. Weekend fares are slightly higher at approximately $290. 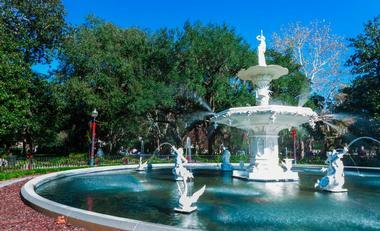 With numerous flights each day there are a lot of opportunities to get to Savannah by plane. For one with limited time, this option appears perfect. American and United Airlines also offer service to Savannah with a couple of drawbacks. One, neither airline offers a non-stop flight. Two, fares are slightly higher on American ($220) and significantly higher on United ($315). So at this point it boils down to one’s choice of preferred airline, which may take precedence over price and time schedule. Hartsfield–Jackson Atlanta International Airport is about 20 miles from downtown Atlanta. From the city center take I-75/85 south to I-85. The airport is just off of I-85. Hartsfield–Jackson Atlanta International Airport has several levels of parking. Hourly and daily parking is available in short-term lots starting at $2/hour and going up to $36/day maximum. Covered parking starts at $3/hour with a $16/day maximum. Economy lots are $3/hour or $12/day. Park and ride lots are $3/hour with a $9 daily maximum. In addition, there are several airport hotels that offer sleep/park packages which are perfect for early morning departures. Whatever one’s parking needs, the Atlanta airport has many options from which to choose. Reservations can be made for parking. Amtrak offers service to Savannah on the Crescent/Carolinian/Palmetto Route and the Crescent/Silver Star Route. Fares start at $170. The route takes over 13 hours one way. The Crescent/Silver Star Route is an overnight route that offers roomettes with two bunks and an in-room sink and toilet or the Viewliner Bedroom which is larger and can accommodate three passengers. The fare for the roomette is $716 roundtrip and the bedroom is $1,108. The amenities for these bedroom options are many: meals are included; reclining seats; a large window; nearby showers (the bedroom has a en suite shower); soap and shower amenities; electrical outlets; climate control; individual reading lights; fold-down table; garment rack; towels and bed linens; coffee; and bottled water. These bedroom options fill up fast so it is recommended on make reservations early. The Crescent/Carolinian/Palmetto Route is overnight as well and has numerous transfers and no bedroom cars; not probably the most convenient of the routes. A business class seat on the Crescent/Silver Star Route costs approximately $461. Exclusive amenities are available for this class of fare. This ticket is fully refundable if cancelled before departure. Business travelers receive a 25% point bonus for Amtrak Guest Rewards members. The business class has a dedicated car with service attendant. Other perks include a pillow, complimentary soft drinks and access to premium digital newspapers. Also available on select routes is train-side checked bike service. Reservations are necessary. Travelers must be able to handle and lift the bike up to the train car themselves. Only standard bikes are permitted; one per person. Amtrak offers a variety of deals that change regularly. Senior discounts of 15%, AAA membership discount, 50% companion fare just to name a few. Restrictions apply. Pets are not allowed on the routes between Atlanta and Savannah. Check out the Amtrak website for additional information and to make your reservations The distance from Savannah to Atlanta is about 250 miles.. There are daily bus trips offered by The Greyhound Bus between Atlanta and Savannah. There are four stations in Atlanta: Atlanta Amtrak, Atlanta Greyhound Station, West Peachtree Street NW, and Turlmex Atlanta Stop. Fares start at $32 depending on the day, time and station of departure. The one way trip lasts about 4.5 hours. Just as technology has advanced, the services and amenities offered on Greyhound bus trips are far superior to yesteryear. Personal, adjustable air vents; bath room on board; wheelchair lift and seating space; one’s choice of seat; priority boarding for certain classes of fares; and overhead storage – all included for the traveler’s comfort and convenience. Other perks include free Wi-Fi, extra leg room, reclining seats, and 3-point safety belts. Greyhound also delivers packages. If one enjoys traveling by bus, Greyhound offers a generous reward program as well. ShuttleFare operates a shuttle from Atlanta to Savannah. The fare starts at $602 one-way. The exorbitant fare does not seem like a practical option, but it is out there. Grand Limousine operates throughout the state of Georgia. For a more personalized, private ride, contact Grand Limousine. With runs between the airports and all over the state, this ride can offer privacy, luxury and convenience. The convenience and flexibility of traveling by car far outweighs any disadvantages. Sightseeing is always a big plus – many things to see along an American roadway. Shops, flea markets, diners, restaurants and more are all part of the road trip experience. Rental cars are available in Atlanta. Economy cars start at $18/day and standard cars are $20/day. 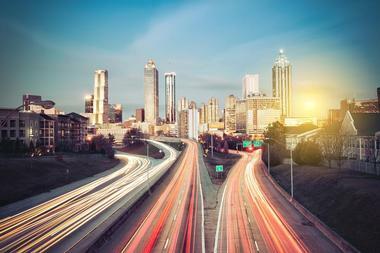 All the major car rental agencies are represented in Atlanta. There are many websites that can help one reserve a car such as Travelocity.com; Hotwire.com; Expedia.com and others. For possibly a cheaper deal one could also check with Priceline.com where one names their own price. 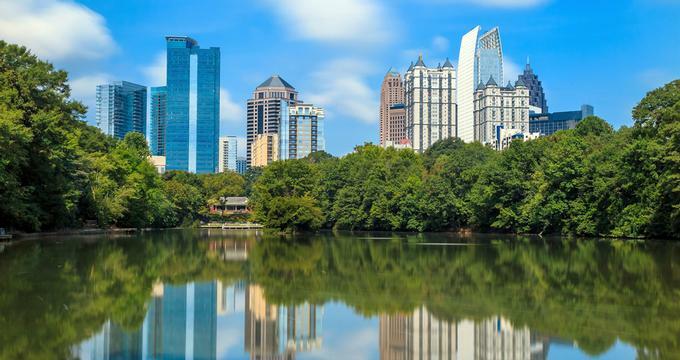 If one has a day or two to spend in Atlanta before heading to Savannah there are a few attractions worth seeing: Michael C. Carlos Museum (ancient art); Fernbank Science Center (planetarium and exhibits); Legoland; Stone Mountain (theme park); Georgia Aquarium; and Zoo Atlanta. One of the most direct routes is to take I-75 south out of Atlanta and connect with I-16. This route will take approximately 3½ hours without making any stops. Take I-75 to Macon where I-16 comes in at Exit 165. Follow I-16 to Savannah. As one nears Savannah, I-16 also receives a name: Jim Gillis Historic Savannah Parkway. This route will take one right into downtown Savannah. In Macon, there are a few things to check out. Macon is home to The Georgia Sports Hall of Fame. There is also a fantastic river walk called the Ocmulgee Heritage Trail along the Ocmulgee River; the trail has over 11 miles of trails through Macon. With plenty of places to stop, enjoy nature, picnic and more, this trail will be a great addition to one’s road trip. An alternate route is to take I-20 out of Atlanta to Madison where one will head south on US Hwy 441. US Hwy. 441 will connect with I-16 at Dublin. This route will take about 4 hours. Just east of US Hwy. 441 south of Madison is the Southern Cross Ranch, a dude ranch styled bed and breakfast with all the amenities one could hope for including a swimming pool and a riding stable. US Hwy. 441 continues over the beautiful Lake Sinclair. At Dublin, get on I-16 and head toward Savannah. Once in Savannah, there will be plenty of things to see and do. Being the oldest city in Georgia, there is an abundance of historic places to see. What a great way to learn about American history. If one needs lodging, there are plentiful bed and breakfast locations, both downtown Savannah and on the coast on Tybee Island. A great selection of hotel chains is also available in Savannah including Doubletree, Comfort Suites, Marriott, Courtyard, Hilton, LaQuinta, and many more. 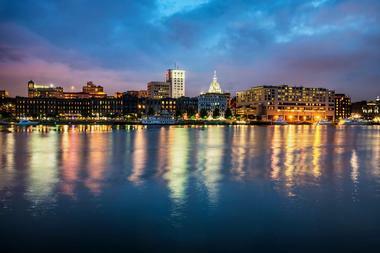 And for one’s eats, there are plenty of options: seafood, sandwiches, pizza, southern down-home cooking, late night hot spots, upscale, casual, eclectic, and ethnic – you name it, Savannah can serve it up. There are two main bicycle routes from Atlanta to Savannah. One is known as the Right Wing and the other the Left Wing. A view of Georgia’s official bike map looks like a spider web with hundreds of trails and highways interconnecting. Before you embark on the ride, make sure you are in great physical shape. This ride is 330 miles with plenty of ups and downs. Plan the gear you will bring – tent, sleeping bag, clothing, food stuffs, water. The use of pannier bags is much easier than a heavy backpack – let the bike carry the load. And about the bike, make sure it is fit to you – your height, weight, reach, the gears, etc. One needs to be able to handle the bike in all types of situations. Also, make sure you have a proper fitting helmet – protection of the cranium is most essential. Plan your trip well, ride with the wind, and enjoy the scenic byways of Georgia. Georgia also has state walking trails. While there are plenty of walking trails there are none that go between Atlanta and Savannah.